1. Find the Dimensions2. Measure Clearance3. Prepare for DeliveryQuestions? 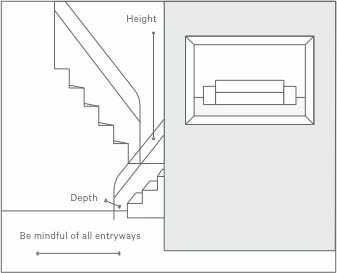 Use the guide below to ensure your piece will fit in your space as well as through the doorways, hallways, stairways, and/or elevators it will have to pass through to get there. 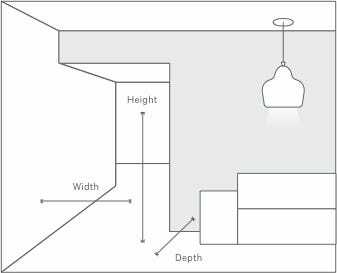 Use these measurements when determining if a piece will fit in an appointed room. We list the length, depth, and height of all our pieces under the dimensions section of each product page. These are taken from the piece’s widest or tallest points. For instance, cushion overhang beyond the frame, the crown (highest point) on a fully fluffed seat cushion, and outward curves and angles are all included. Please note that our factory allows for a one-inch margin when measuring the size of your piece during inspection. Add an extra three inches to determine if a piece will fit through doorways, hallways, stairways, and elevators. Your piece may be shipped in a box or boxes (in some cases, it will arrive in protective plastic). 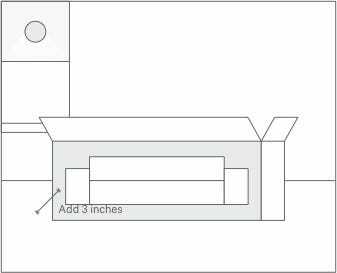 The dimensions of your piece if boxed are usually about three inches longer on each dimension. To allow for easier movement from the delivery truck to your home, large sectionals may be delivered in multiple pieces or boxes, then assembled on site. In some instances, the delivery team may remove your piece from its box to better fit it through your entryway and beyond. Bed or Dining Flat-packed. Fits through most halls, doorways, and stairwells. Keep in mind that these are just general guidelines. Please contact us at order@interiordefine.com. to confirm more precise dimensions and details. Consider the pathway the piece will need to travel from the street to the room where you wish to keep it. Measure the items listed below along this path. As you go, factor in low or angled ceilings, banisters, tight corners, and low-hanging light fixtures that may impede movement. 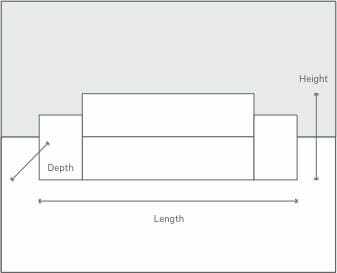 Compare these measurements against the length, depth, and height of the piece (plus three inches to account for boxes) to ensure it will fit through each section of the pathway. Measure the height and width of all entryways and hallways. 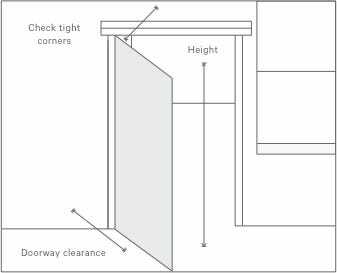 Measure the clearance of each entryway. This is the distance from the outside wall through the doorway to the opposite wall. If it is shorter than the length of your piece, your piece will need to be entered on its side. Check that the height of the entryway exceeds the length of your piece in order to accommodate this. 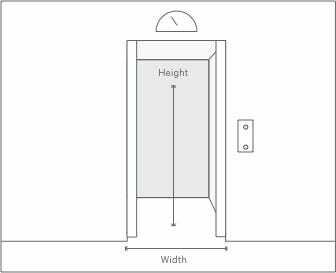 Measure the interior width, depth, and height of all elevators to be used. Include the width and height of the elevator doors when open. 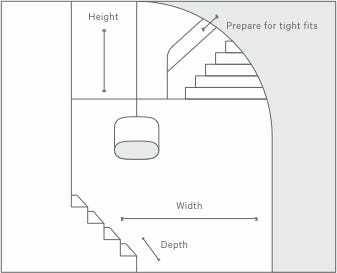 Measure the width of your stairway, accounting for banisters. Include the height from the top and bottom steps to the ceiling. Take stock of slanted ceilings, stairwell turns, and landings that your piece will have to fit around, through, and on. Confirm that the unboxed, assembled piece will fit in the room where you want to put it. If helpful, use painter’s tape to outline the piece’s length, depth, and height within the appointed space. It may help to compare the dimensions of your new piece to current furniture. If your current furniture was successfully moved into your space, then a similarly sized piece should also fit. Comparisons like this shouldn’t be relied on as a substitute for thorough measuring; use them only as an added confirmation. Remove any potential obstacles between the door and your piece’s final placement, such as plants, chairs, accent tables, or throw rugs. Remove any frames, artwork, or light fixtures from walls to avoid bumps or scratches. If your piece does not fit, we will consider this a refusal at delivery, and the delivery team will bring the piece back with them on the truck. Please reach out as soon as possible to let us know if this has happened. We will follow our standard return and exchange policy in this event. 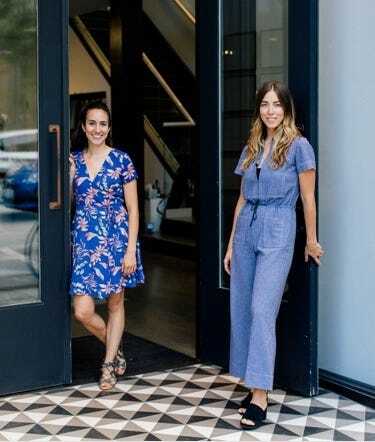 Have no fear, our Design Specialists can help you measure pieces for fit, create floor plan drawings, and help you visualize pieces in your home.